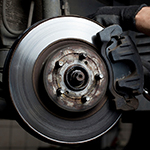 To keep your vehicle's braking system in optimal condition, you should have its brake pads replaced on a regular basis. The brake pads are important because they act as a buffer and apply pressure and friction to the rotors (the shiny discs that you may be able to see behind the wheels). You should reference your owner's manual to see what your vehicle's manufacturer recommends when it comes to changing the brake pads. With most vehicles, brake pads will need to be changed every 50,000 miles. There are some vehicles that may need to have them changed every 25,000 miles and some every 70,000 miles. If you hear a squeaking noise when you brake or jittery braking, then take your vehicle to a service center for a brake pad inspection. It is suggested to use brand name brake pads because they typically adhere to FMSI brake standards and choose brake pads that offer factory style shims.